My father grew up on an Illinois truck farm during the Depression and consequently had an affinity for land. During family vacations in Kitty Hawk (1965) and Kill Devil Hills (1968-69), Dad asked Outer Banks locals where they would buy land if they could, and the answer was always the same: Southern Shores. Some of you may remember my gregarious father, a physician-scientist who went by Dr. Al, loved to play golf with the Duck Woods scramblers, and died in 2014. He spent the last 18 years of his long life living with my mother, Fern, on N. Dogwood Trail. Mom is still there. Neighbor Randy Herring dubbed my mother the “Queen of North Dogwood Trail” because she daily walked her dog and expressed gentle, kind words to all she met. To control growth, the Kitty Hawk Land Co., to which founder Frank Stick transferred his ownership in Southern Shores, staggered the sale of lots. One day KHLC called my father and offered him an oceanfront lot, sight unseen, for $10,000: Take it or leave it, you have 24 hours to decide. My grandfather, the farmer, thought it was a poor investment, but he loaned Dad the money, anyway. Soon thereafter, the red house on pilings was built. I fell in love with the woods of Southern Shores in the early 1970s when I “cruised” the unpopulated Dogwood trails in the family station wagon with my older sister and friends. For a break from the family-vacation scene, we teenagers would drive in and around the moss-laden dark forest and the wide-open dunes, marveling at their other-worldliness. The Southern Shores forest looked like the South Carolina low country, exotic and lush. There was only a dusting of houses then: 166 S. Dogwood Trail, 70 Hickory Trail. Over in the dunes, my brother and his friends could ride their mini-bikes, unimpeded by any residential development. At the peak of the hill on Hillcrest Drive, above the modern-day tennis courts, we could see the Currituck Sound and the ocean simultaneously. It was glorious. At 16, I vowed: “I’m going to live here when I grow up.” I didn’t mean on the Outer Banks. I meant surrounded by the dense, luxuriant, and surreal forest of Southern Shores. Its beauty captivated my writer’s soul and my sense of wonder. I was already writing, but I also was championing socially progressive causes and intended to be a lawyer. I had no idea how I would return to Southern Shores, but I knew I would never really leave. When I became the book-review editor for The Virginian-Pilot in 1991, I seized the opportunity: I moved in stages—first, part-time and then full-time—to the Southern Shores woods. (See Home.) Telecommuting enabled me to fulfill my dream. Starting with Mapquest, the computer also brought into the year-round residential area the traffic that now diminishes our quiet enjoyment. Before I bought my house on Hickory Trail, I lived in a rental on S. Dogwood Trail, which was then a peaceful, little-traveled road. When I testified at a 1997 public hearing in Aydlett, N.C., about the need for a bridge from the Currituck mainland to Corolla, I had in mind reducing the oppressive traffic backups on Hwy. 12, not the Dogwood trails, much less Hickory, Hillcrest, and Sea Oats. (I was the only one at the Aydlett hearing who supported the bridge.) I’m not sure when I noticed that Hickory Trail had become a key segment of the residential cut-through, but certainly not within the first five to eight years of my residency. There has been more than enough time for forward-thinking public officials to anticipate and ameliorate the new traffic crush. 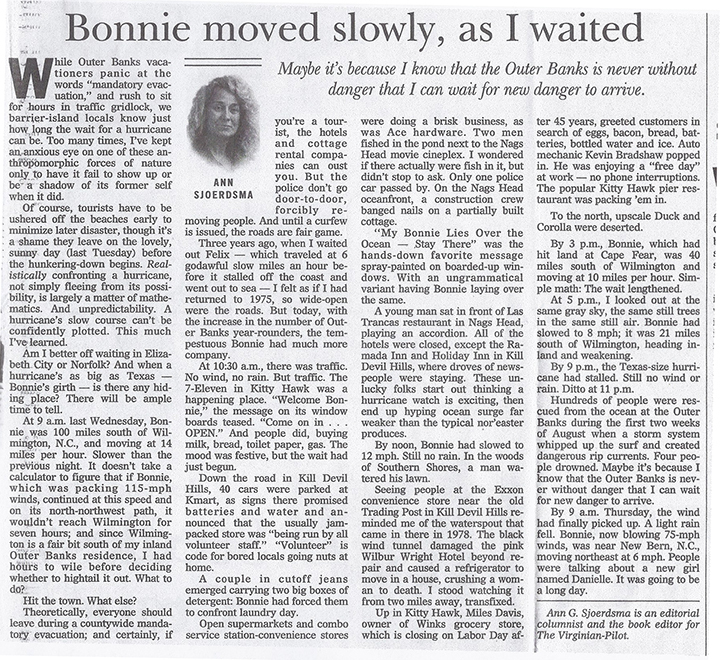 Some of you may remember my columns in The Virginian-Pilot. I have posted four of them here. If you only read one, please read the column about accountability. It contains the apropos sentence: “Fiscal responsibility is a prime criterion for political office on the tax-conscious Outer Banks, and ‘throw the rascals out’ is a prime incentive for voting.” Former Dare County Commissioner Cheryl Byrd, who called for accountability from a board colleague, lived on S. Dogwood Trail. 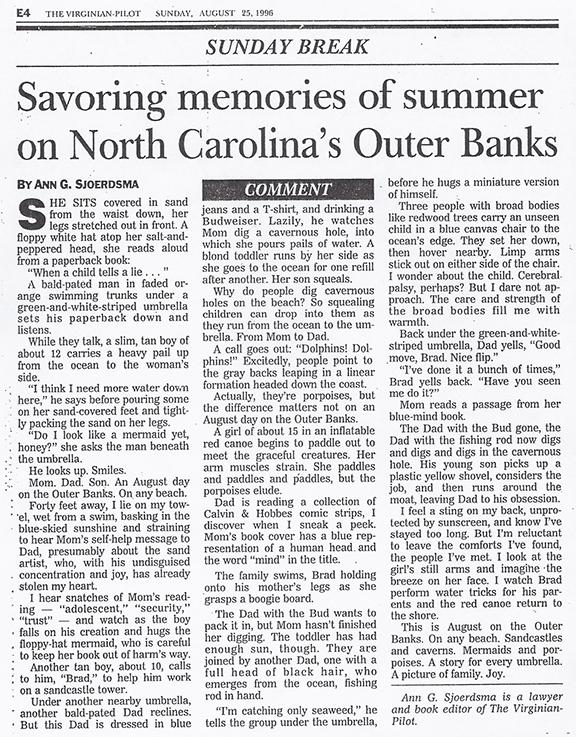 I have many heartwarming memories of the Outer Banks and the Southern Shores of yesteryear. One of my fondest is of the venerable Benton Pipkin of Reidsville, N.C., who owned the “Pink Perfection” flat top next door to our cottage on pilings. Benton’s son and his family now maintain their historic beach home. In my mind’s eye, I still see the jowly, thick-legged Benton Pipkin, cigar clenched in his teeth, bourbon bottle in hand, crossing the dune between our houses at day’s end. Mr. Pipkin, who was in his late 70s or early 80s when I knew him, had a sonorous baritone of a voice, thickened by an opulent Southern drawl. Truly a scholar and a gentleman, he possessed the Southerner’s gift of dry-witted storytelling. But he met his Midwestern match in my father, who loved to play to an audience and always could get laughs. I like to think of the two of them sharing wildly embellished tales and Jim Beam in the twilight. They appreciated each other, and I appreciated them. I don’t live in the past, but I am aware that without a rich past, one cannot envision a rich present or future. The past informs the future. I believe in the promise of Southern Shores, my longtime home, and in the people who, like me, chose to live here.